What do you do when… you purchased a pint of figs to make a dessert but then one thing leads to another and the dessert doesn't get made and you have to go out of town and you don't want the figs to go bad? Why you can them in a spiced honey syrup…of course! 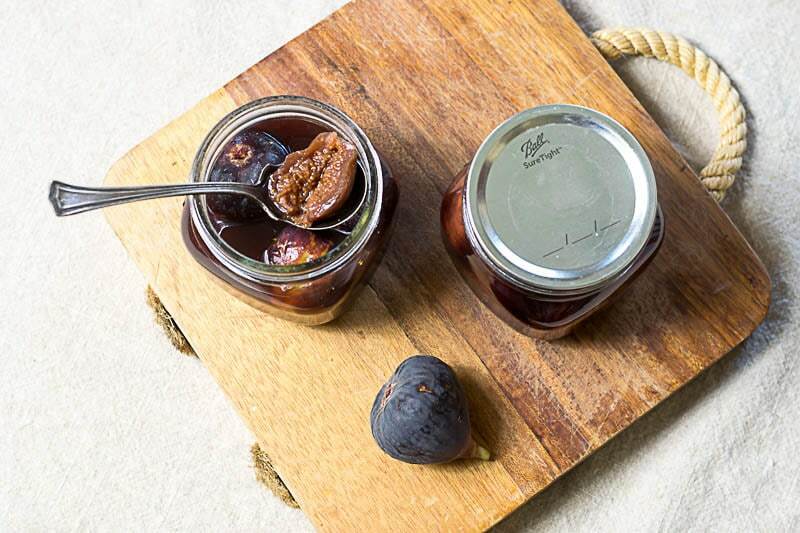 This recipe for Figs in Spiced Honey is a quick, small-batch preserve that elevates just about everything you pair it with. In fact, I'm also sharing my recipe for Spiced Fig Parfaits made with these canned figs. This dessert just speaks of fall and winter…it can be made ahead of time and is SOOO easy. When I started out canning, I would reserve a whole day in the kitchen for the process. But then, once I got my system down, I realized just how quickly I could get my preserving done, especially when small-batch preserving. I can put up a couple of jars of a preserve in about the same time I could bake a batch of cookies. So when I found myself with a pin of Black Mission Figs that I needed to do something with before we needed to head out of town, putting up a small batch of Figs in Spiced Honey was the perfect solution. That Ball Complete Book of Home Preserving is my bible. Even if I think I could make the recipe in my sleep, I double check myself against the Ball Book…that whole botulism thing. Prepare canner, jars, and lids. See The Ball Complete Book of Home Preserving for guidance. Lay out a clean towel, along with a small bowl of white vinegar (to wipe off rims) and your canning supplies on a clean counter. Put honey, water, orange zest, cinnamon and cloves in a pot. Bring to a boil and simmer for 3 minutes. Add figs to the syrup and boil for 3 minutes. 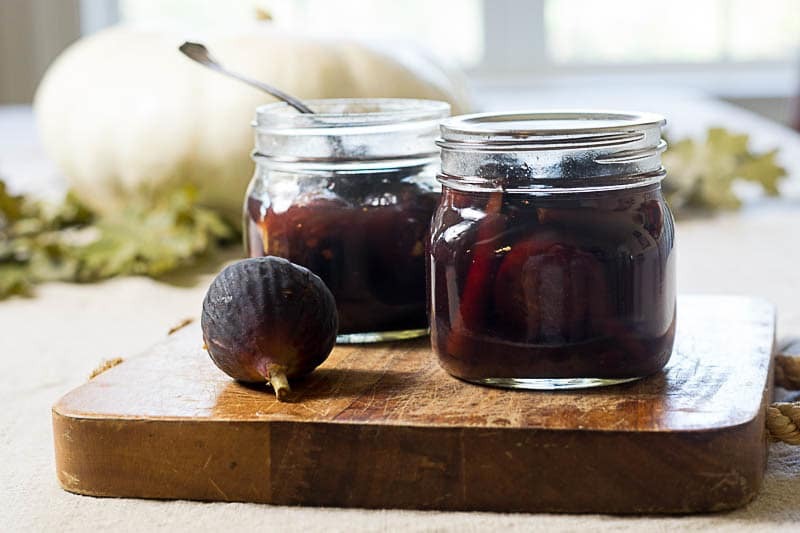 Using a slotted spoon, pack the figs into prepared jars. Divide cinnamon sticks and cloves between the two jars. Remove any air bubbles and adjust headspace. Boil for pints jars for full 45 minutes, or adjust for altitude via Ball Complete Book of Home Preserving. The time to bring your pot to a boil should not be counted in the minute boil time. Once processing time is complete, remove the lid and wait for 5 minutes before taking the jars out of the pot. Let rest, undisturbed, for 24 hours. Refrigerate any unsealed jars. OK…so this was a 2-for-1 recipe bonus day! Add all ingredients to the bowl of a stand mixer and whip until it forms stiff peaks. Layer whipped cream, crushed cookies and figs in a parfait glass or dessert bowl. You can make this whipped cream ahead of time. I made it 8 hours before serving and it was fine. If it needs, just whip it with a whisk right before serving. Thanks for a great video demonstration. You make it seem so easy and do-able! Hope to find some figs soon and make this for gift giving. Hope to see more videos on the future. Hey Barbara, thanks for the kind comments. I’m trying to get more comfortable in front of the camera…not my typically MO. But, I know it’s useful for folks to see how to make some of these things, so I’m getting there. Hope you have a wonderful weekend my friend. How are your daughters recovering from the hurricane?